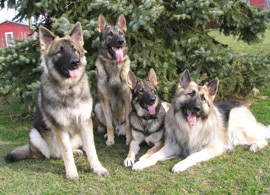 In order to preserve the superior temperament of our beloved Shiloh Shepherd breed, the ISSDC affiliated registries: NSBR, TSSR, and WSSBA have maintained a pronounced and united requirement for adult registration, one of which demands a proven designation of either the following choices: ATT's Temperament Tested Title, Canine Good Citizen Award, Canine Good Neighbor Certificate or a comparable authorized equivalent. The American Temperament Test Society, Inc. offers an outstanding opportunity to evaluate any dog's disposition by judging the canine inborn reflexes via the exhibition of natural social tendencies, boldness, curiosity, anxiety, recovery, fear and/or aggression. These are not to be confused with conditioned or learned responses. The overall results of the TT are also an excellent outline of your dog's emotional comfort zone. Ethical breeders realize the critical importance of such universal testing, especially with regard to future litter projections. Studies show puppies which develop undesirable behavior under environmental stress or any form of mental breakdown, do so to some extent because of hereditary factors. Evidence and further exploration of neuroses in several breeds indicate that their various thresholds are genetic. Fifteen years after initial recognition in 1991, the SHILOH SHEPHERD SURPASSES ALL the Top Ten Herding Breeds in the country! The ISSDC is here to celebrate our incredible ATTS rating of 80.0 (2011 stats)!!! Please read the results of this most recent ISSDC temperament test survey according to the combined statistics (cross-checked) from American Temperament Testing Society, American Kennel Club and the American Herding Breed Association, as of December, 2006.